For all your Sheet Metalwork needs! 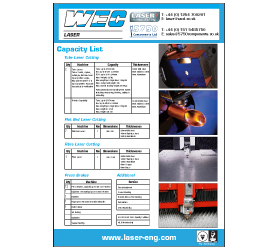 WEC Laser provide a fast, flexible and economical Sheet Metalwork and Fabrication service. Using profiles produced by our Laser Cutting division, we can fabricate materials including Mild Steel, Stainless Steel, Aluminium, Brass and Copper to name but a few. 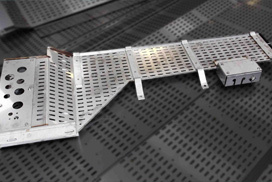 With over 30 years' experience in the sheet metalwork market, our highly-skilled team of in-house sheet metal fabricators and coded welders enable us to have complete control over lead time and quality. We also offer a variety of finishing techniques such as vaqua blasting, powder coating, painting and polishing, making us a true one-stop-shop for all your sheet metalwork requirements. 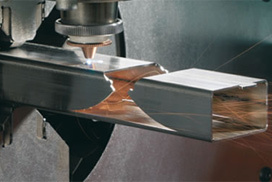 Not only that, but WEC Laser offer Box section fabrication using profiles cut on our laser tube cutting machines. Box Sections and Tubes are seam welded, and we can supply this material in Cold Rolled, Hot Rolled and S355 for more critical applications.